After a good nights sleep we woke up at dawn, having been advised to get into Banff before 8am to avoid the crowds arrived. There was just enough time to fly LARS over the mountain, taking photos of the smoke settling in the valley and the red skies of the sunrise. 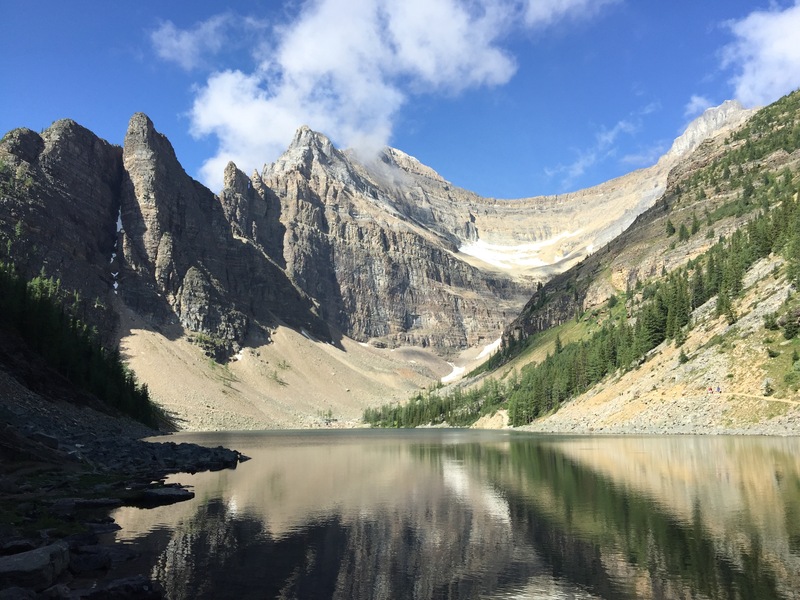 From Heather Mountain we passed through Golden and into Banff National Park – thanks to it being the 150th Anniversary of Canada all park entrances are free! After a quick stop at the visitor centre to collect maps, we headed up to the Lake side. The car park was already starting to fill up but we managed to find a space and join the masses, assembled on the waters edge taking photos of the Lake which was unfortunately covered in cloud and mist. 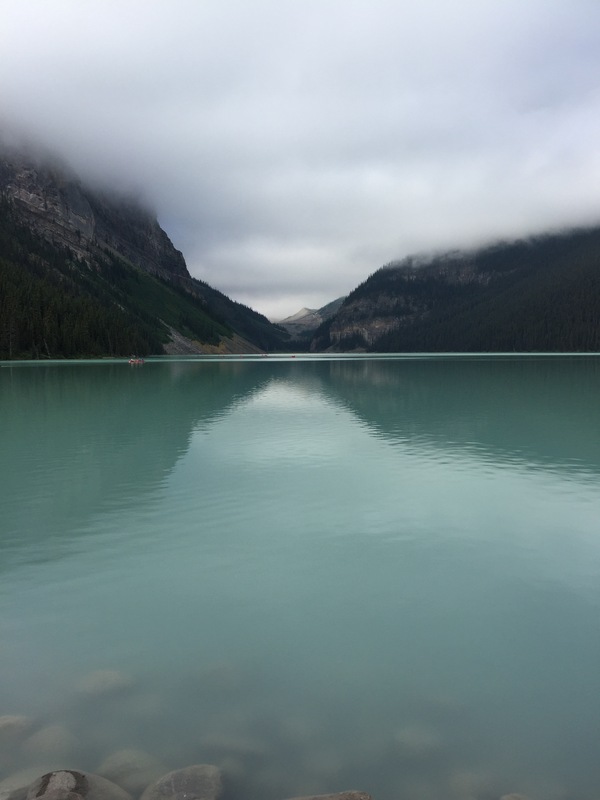 The waters of Lake Louise were still an exotic creamy minty green follow thanks to the glacier waters flowing down from the surrounding mountain peaks. The weather was cold in the morning fog so we were all wrapped up and ready to hike one of the many trails. We picked the less busy upper route, while the fatties and oldies all took the waters edge one. We soon realised we’d picked a tough work out as the gradient steepened and we shed our hoodies as we broke a sweat. 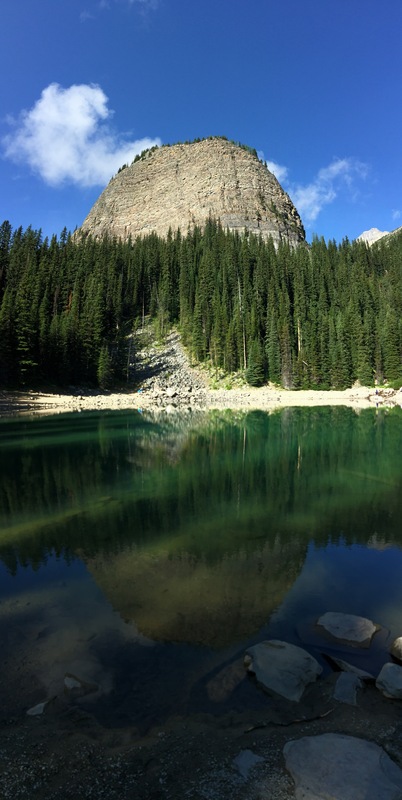 On the six mile ascent we caught only glimpses of the Lake below, before arriving at Mirror Lake – a perfectly still pond which beautifully reflects the Large Bee-hive, a butte which stands over the Lake. After a pause for water and photos we continued on the path the Little Bee-hive, occasionally being passed by other hikers and people on the horse trail. By lunch time the morning fog had broken and the sun was beating down. With calves burning we reached the rest stop at Lake Agnes and grabbed a seat in the mountain restaurant for some lunch. While our food was being prepared, Jamie and I made a rapid climb to Little Bee-hive. While steep it was worth the pain, getting the best views down over Lake Louise from a dramatic sheer cliff edge. After lunch we started our descent, Vanessa and Andy opting to return along the path we just climbed, while we took a longer route down via the far end of the Lake. 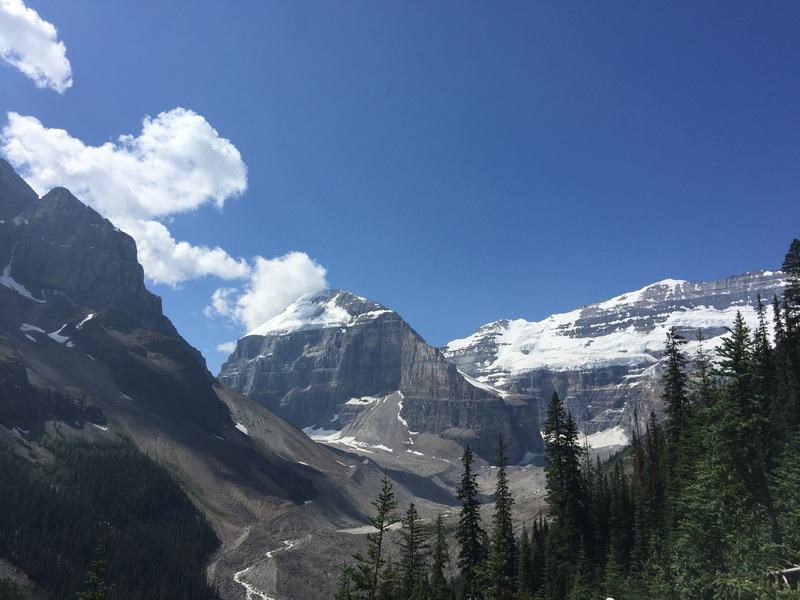 Along our trail we got good views of the Glaciers, however Lake Louise was always obscured by trees – as well maintained as Banff is, it could do with some more viewing points and some of the trees being trimmed! After following the winding switch backs down to lake level, we followed a boardwalk along the glacial rivers that fill Lake Louise. Along the busy walk, mountain climbers scaled the cliff faces, kayakers paddled on the waters, while some had beached their boats and walked the shores. As we finished our trek around Lake Louise we stopped at the Fremont Hotel for a snack and wifi. It was now 2pm and we planned a short stop at the Gondola before heading to our hotel in nearby Kootenay Park. We’d however just received an email from the hotel, sent two hours earlier to say that they were cancelling our first nights stay due to smoke from the fires and would advise the following day if they were cancelling our second night. No apologies for the late notice, no advice on finding a last minute hotel and no information on refunds. Queue frantic calls to Hotels.com asking about refunds and arranging a last minute hotel for the night. 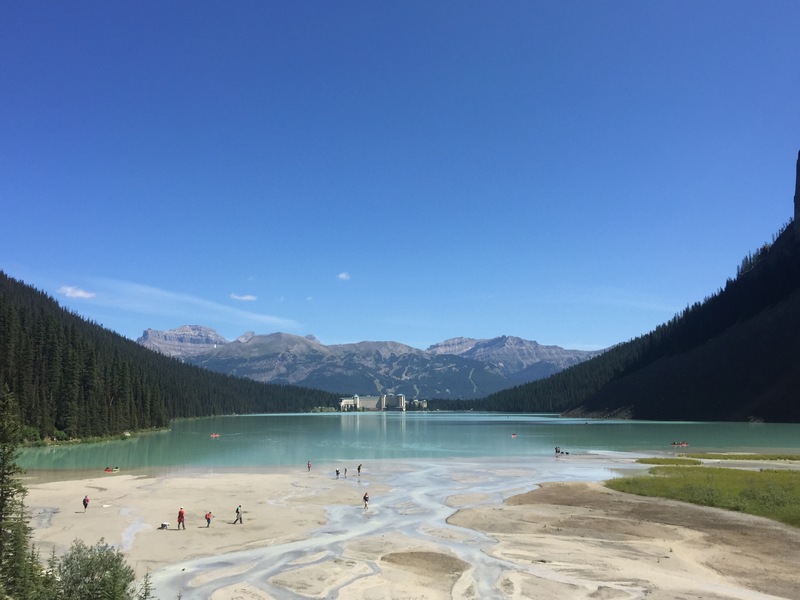 We arrived at the Lake Louise Ski Lodge, which during the summer runs the gondola up the mountain for hiking the ‘Grizzly Trail’ – hopefully that meant the chance to see bears rather than meeting a grizzly end. It felt a little overpriced at $30 per person but we were all now in the outdoor spirit and enjoyed our slow ride to the top. We opted to take the shorter of the two trails at the summit, however mid hike we discovered it wasn’t a circular so we’d have to walk back the distance we’d already travelled. With the afternoon sun baking down we abandoned the trek and took some photos across the valley to Lake Louise. We rode the Gondola back down to the Lodge and enjoyed a cold beer and light snack while we tried to resolve our hotel issues. After trying to phone the hotel with no luck, we got through to Hotels.com who passed us from department to department. In total it took over two of arguing and repeating ourselves before we got moved to the Holiday Inn in Canmore, over an hours drive away. 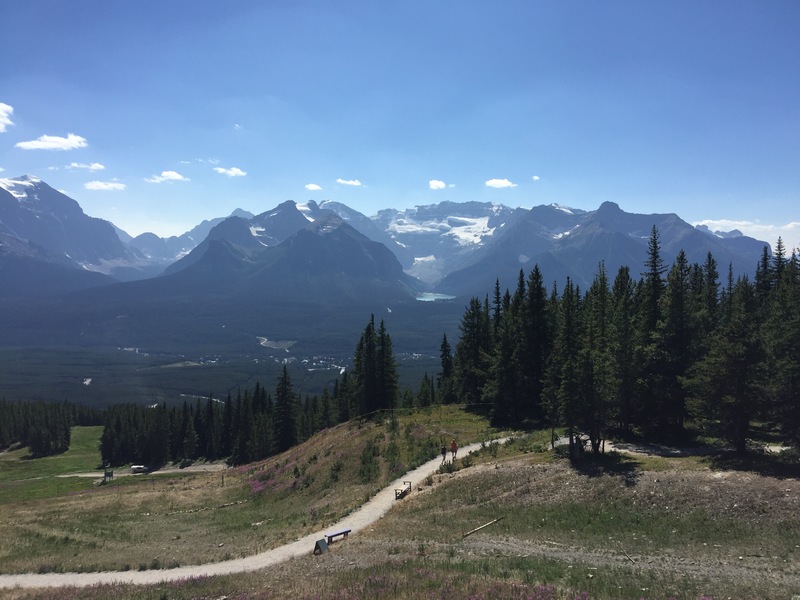 Our two nights in a cabin in Banff had turned into two nights at a run down Holiday Inn outside the Park and it cost us an extra $923! We arrived at our new hotel at 8pm, exhausted and not impressed with our hotel situation.